Look what SHE'S done now! Do you notice anything in this picture? Nothing, you say. Well that's the point! Saturday afternoon we were locked up confined to a bedroom, with pigs' ears, and strangers came to the house. When we were let out, all of our furniture was gone! Well, not HER special chair, but the couch and chairs that we sleep on, and have slept on for eleven years--completely gone. What do you think about that? Now that the summer heat has come, we get up early and go for long walks. This was one of the longest we've had so far. Our river has lots of places to walk along, but this is our favourite. Mostly we get to run free! Firstly, we park our little car and check out the picnic area. Then we head down the cycleway to the first bridge. That's Bella in front. She's no longer frightened of the bridge. Then we continue, taking time out to check pee-mail and chase birds of course, until we come to the second bridge. That's where OUR beach is. We usually stop right there, but this time we walked over the second bridge, up the hill and started walking along the opposite of the river. The river is now on our left and sports fields on our right. That's Bella, banana tail, in the front. And had a paddle in the water. We are actually across the river from the picnic area. Then we walked ALL the way back to our car. We were very tired, and the sun was getting higher. It was a wonderful walk. We were wet and dirty. And yes, we had to have a B-A-T-H. But then, so did the car!!!! This our hill down by the river. We love to run up and down that hill. Oh, that's not a spaceship on the top. It is the club house of the local Lawn Bowls Club. Well, the last few times we've gone to OUR hill for a run, there have been humans using it. They try to do zoomies up and down. But they are sooooo slow. No way would it pass for zoomies. When they get to the bottom, they lie down and try to sit up again. Sometimes it takes them about 87 times to actually get back up. Then they do it all over again! We'd love to demonstrate proper zoomies--but we aren't allowed to run free. Guess they'll never get the hang of it. Believe me, they are pathetic! It's Friday, and time for friends. We've met a few more dogs in Blogville and thought we'd let you know about them. We're sure they'd love a visit. Firstly, is Spur , he's a Beauceron. We'd never heard of those, but pop over and learn more. Then there's Rubie the Schnauzer who lives here in Australia. And finally is a little guy named Bowie. Just click on the link and go make them welcome. This morning we went for a walk by the river. It has been hot--over 100 for a few days--so we go for a very long walk early in the morning. This morning when we got to the picnic area, I found a whole slice of bread. Someone must have left it for the birds. Well, I found it. It was mine! AND SHE pulled it right out of my mouth. Just grabbed it and ripped it right out! I was so surprised I didn't even chomp down and save a bit of crust. So I got nothin'. Then SHE threw it away! How unfair is that?!!! Daisy, Kendra and Bella show FG some nationalism. We went for FOUR walks today! One was to the duck pond. SHE forgot the camera......AGAIN! So this is just an old picture to remind you of what it looks like. The pond water was much clearer today and there were loads of ducks. They must have thought we were going to feed them because they followed us around. There were four tiny ducklings that Bella kept trying to get. But Kendra was the more excited by them. She ran back and forth acting like a puppy. She even fell in and had to be pulled out. She really wanted one of those ducklings. The duck pond is Kendra's favourite walk. There were also three swans. We've never seen them before. 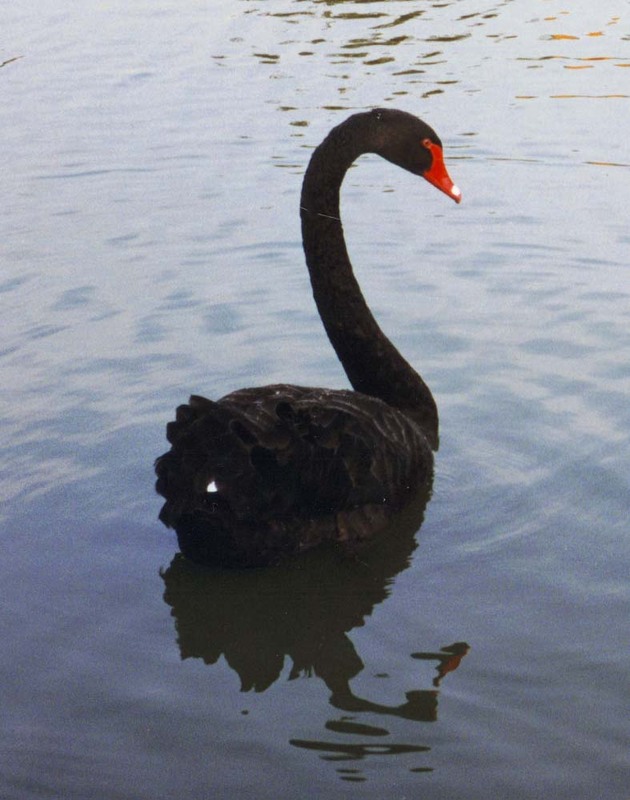 Did you know Australian swans are black? Well you do now. We had to get this off the Internet because of the NO CAMERA! She was using the tile as a pillow. She is allowed to sleep wherever she chooses and this is it! Think she's dreaming of ducklings? Can I get out now? Sorry about the mix-up about the bridge yesterday! But after we got Bella over the footbridge. We walked up to our other bridge..... and beach. This is what it looked like last time we visited. Our beach is nearly back, too. It's still a bit muddy but there is some sand. I sniffed everything. There were lots of animal foot prints. And got sand on her nose. We are so happy that OUR beach is back! After the river flooded, the foot bridge surface was buckled, so it was replaced with a new surface. It's yellow and has holes in it. Bella was too scared to walk on it. Once on the other side, we noticed we had an audience. Mum, what are those strange-looking black things? On the way back, Bella had no problem with the new surface. I've just been reading an interesting article in the latest Dog's Life magazine. Gone thank heavens are the chewing and the accidents-in-the-house stages; but we now have a teenage dog who runs off when she can, ignores being called or directions--even more than the usual terrier character--makes her own rules and can be exasperating. She jumps up on furniture to steal food, tries to grab treats out of HER hand, pushes to the front.......the list goes on! Then, she suddenly becomes a puppy again, wanting cuddles or reassurance. Luckily, it doesn't last as long a human adolescence and she'll be 2 in March, so maybe we're at the end of this phase. Any more adolescent dogs out there? Share. Last night our friend Marli came to visit. Her family was having a party and she wasn't invited. At first, she couldn't believe she'd been left behind. Then she tried to escape. But stopped when told 'NO'. Next, we had a wild game of zoomies-- too fast for the camera. It was hot and humid, so it was a short, wild game of zoomies. We went inside where it was cool, had a rawhide chewy and settled down for a sleep. See our tongues hangin' out after playing? Sorry there's no group shot of the four of us.......like that was going to happen. The photographer only managed three, blurred black shapes in one frame. Hi everyone, Bella here. I've managed to wrest the computer from Daisy who thinks She's in line to be next top dog. I just wanted to tell you that I, Bella, am the only dog here who can jump up on the big bed. It's like I have springs in my legs. I can jump VERY high. First of all SHE wants you to know that we do have beds. Futon things that are nice and comfortable that we ignore. We tend to sleep wherever. Now that it's warm at night. We can be found at various spots around the house. We move around. Kendra's favourite spot at the moment is in the bathroom on the tiles. Sometimes Bella or I try it out; but if old grumpy Kendra comes along, we move. Nothin' much going on here today. We DID get some rain......we're sure it was all your rain wishes for us. AND it was just the right amount and it rained during the night....very convenient! We got the following pictures in an e-mail, so they've probably been around the world many times, but we thought they were funny and decided to share. Enjoy. Happy 1/11/11 or 11/1/11, either way you look at it!